A key illustration from the article features artists and guests riding the engine. 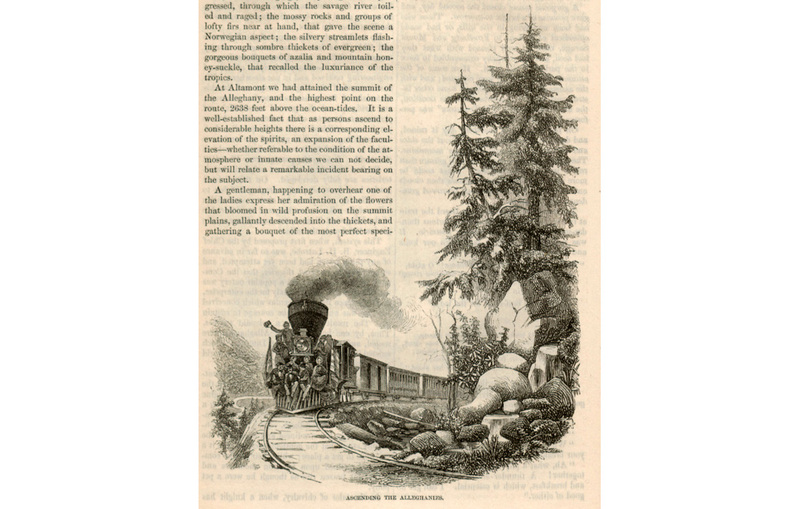 "As the train commenced ascending the mountain a number of the excursionists, including the ladies, took their seats on the front of the engine and cow-catcher, for the purpose of obtaining a better view of the grand scenes which were opening before and around them. Such was the confidence felt in the steadiness and docility of the mighty steed that the gentlemen considered it a privilege to got a place; while their gentler companions reclined upon his iron shoulders and patted his brazen ribs as though he were a pet pony." One of the most striking illustrations of the article "Artists' Excursion Over The Baltimore & Ohio Rail Road." Echoes the composition of the photograph "Baltimore & Ohio Railroad artist excursion, 1858."